Selling computers and consumer electronics can attract some interesting characters. I own and operate an online e-commerce business selling computers (EZ Trading Computers), so I’ve been exposed to the many fraudsters, crooks, hackers, and trolls online. Not fun! You could call it the underbelly of the internet. It’s always there even if you don’t know about it. I take fraud and identity theft very seriously–for my household, my business, and my customers. Today, I want to educate you about this pervasive problem, based on what I’ve learned over the last six to seven years. Everyone should be vigilant in their habits for preventing identity theft, especially traders. Our digital life is interconnected. Social profiles, online transactions, and even snail mail, can be used to hack entire identities (including bank accounts and trading accounts). This post is not meant to be a scare tactic. Don’t be frightened. Be aware. 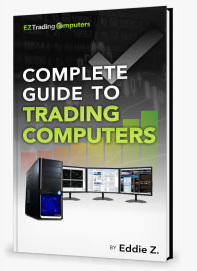 My main goal in writing this blog is to educate traders in all aspects of computer hardware. However, digital security and identity theft prevention are also aspects of being an individual trader. It’s crucial that you understand the ways identity theft can occur. Once you understand the games these identity pirates play, it’s easier to limit your exposure. Here are five common ways your identity can be stolen. Hacking personal data from a third party (e.g., a retail store) and selling it to thieves (typically overseas). Rather that allow yourself to be exposed to these risks, why not avoid the emergency altogether? Put safe guards in place now to prevent the painful process of having to call your bank or credit agency. Here are a few habits I recommend to keep your identity safe both online and offline. Don’t use your debit card online (or, possibly, ever). Constantly review your credit card statements for fishy transactions or odd dollar amounts. Consider how your name will be used before you sign up for marketing lists, credit bureaus, or even customer loyalty programs with retailers. Make sure the pain (and exposure) will be worth the gain of whatever they’re offering. Review your mail, even the junk mail. Don’t leave mail lying around the house. Best practice is to shred all paperwork or junk mail before you throw it out. But if you don’t have a shredder, at least tear off the section showing any personal information and rip that part into small pieces. Follow best practices for creating account passwords. If you want to maintain a written list, keep it in the safe with your important documents. Whether you are a full-time or part-time trader, you need to be forming habits like these that can help you prevent identity theft. Many people believe they are only at risk of identity theft when they’re using the internet for making transactions. This is a misconception. In reality, paying with debit or credit anywhere can put you at risk. In fact, the worst case of fraud I’ve seen on my own credit card came from paying for food at a local restaurant. In short, be smart about the risks inherent in all non-cash transactions.